The 2004 Big Dog Mastiff for Sale is located in Texas and is for sale by private owner. It's painted black with purple ghost flames inside blue flames. The custom motorcycle has Vance & Hines straight exhaust pipes, a blue chopper light kit, new front tire, new ehc, a new stator and rotor package and a new voltage regulator. The motorcycle's rear tire is 240mm and the Big Dog Mastiff motorcycle for sale has a 107 cubic inch S&S motor with a Baker 6 speed trasnmission with 11,200 miles total riding time on it. I can give you picture information if you will send me your questions and contact information in the space below provided by Strike Lightning Used Motorcycles for Sale and I will get back with you as soon as possible. 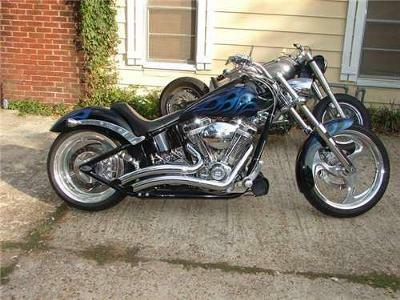 Strike Lightning would also encourage bikers to submit a review of the 2004 Big Dog Mastiff for Sale to help potential buyers make informed decisions and to benefit the biker community as a whole.